The Canon PowerShot G1 X was announced recently, and took a lot of people by surprise. While Nikon have launched their mirrorless, large sensor cameras in the Nikon 1 series, not many rumors existed about Canons mirrorless competitor. It turns out that their answer was a large sensor compact camera, without interchangeable lenses. The sensor size was also a bit surprising: Larger than Four Thirds, but smaller than APS-C. This sounds like an odd sensor format. But is the sensor format really that odd? Let's try to have a closer look at it. We know that the Canon G1X sensor is reported to be 18.7mm x 14mm. The Four Thirds sensor size, on the other hand, is somewhat smaller at 17.3mm x 13mm. But the Panasonic GH1 and GH2 have employed oversized Four Thirds sensors. This design choice was implemented to get the same diagonal field of view in the 16:9 and 4:3 modes, utilizing the full image circle also for video. The Panasonic GH1 has 4000x3000 pixels in 4:3 mode, and is 4352 pixels wide in 16:9 mode. This means that the width of the sensor must be 17.3mm x 4352 / 4000 = 18.8mm. 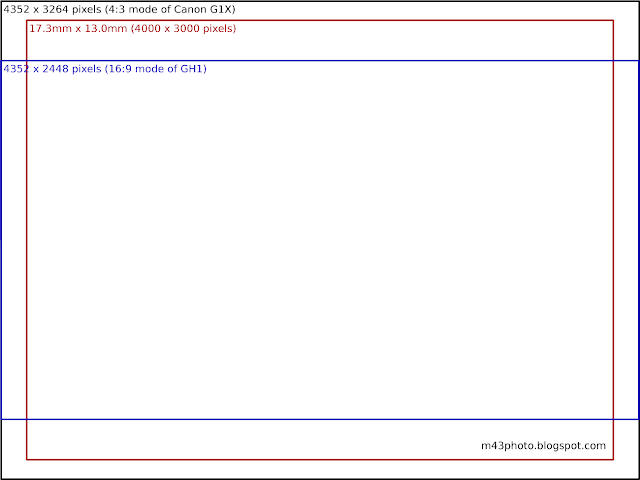 Which is rather close to the reported width of the Canon G1X sensor. The differences in reported size might be due to rounding off differently. What about the vertical size? The GH1 sensor is reported to have 14 megapixels in total, which corresponds to a vertical resolution of 3217 pixels. Hence, the vertical size must be 13mm x 3217 / 3000 = 13.9mm. 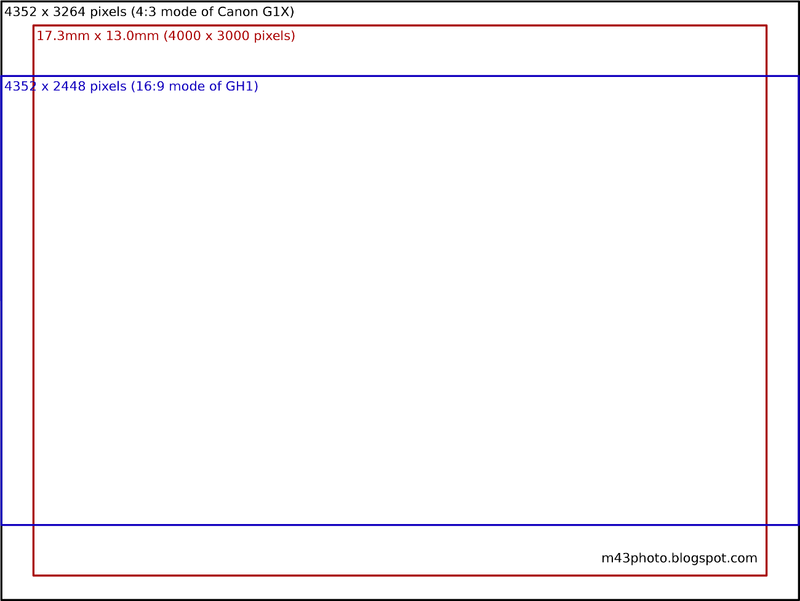 Again this is very close to the reported height of the Canon G1X sensor. Both sensors are of the CMOS type, and both have a base ISO of 100. My conclusion is that the specifications of the Canon PowerShot G1 X sensor are remarkably similar to the Panasonic GH1 sensor. This doesn't mean that they are identical, though. But given that there are not that many sensor manufacturers out there, and certainly not for the Four Thirds sensor size, I would say this is a good indication that Panasonic do in fact produce the sensors for the Canons G1X. As you understand, this is of course purely speculation. A fundamental difference between the two cameras is that the Panasonic GH1 only gives you a maximum resolution of 12 megapixels for one single exposure, with the option of changing the aspect ratio with the same image circle. The Canon G1X, on the other hand, gives the full sensor resolution output for a single exposure. However, when using video (16:9 aspect ratio), only a smaller image circle is used, meaning that the effective focal length changes. 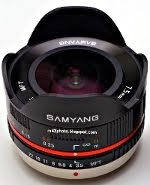 - Who made the sensor for Canon EOS-1D? I personally don't think it is the same sensor or is made by Panasonic, but rather it is a convenient size and resolution. Mostly because Panasonic still lags behind Canon in terms of noise performance. Anyways, G1 X is pretty interesting, I hope it would get wider auto-ISO range and some bits of feature that is already on older cameras like 5D MK2 (Like highlight priority...). Oh, just one early complaint, the AF-assist beam is crap, all it does is blind whoever you are shooting, and not really helping anything. I think it is because when you shoot in dark area, the sensor is already cranked way up so that you can see something in the LCD. When the AF assist beam shows up, the scene became way over-exposed from the bright beam. Of course the camera would need time to stop down and do this and that. It just makes it even slower. What can we expect from the GH3?